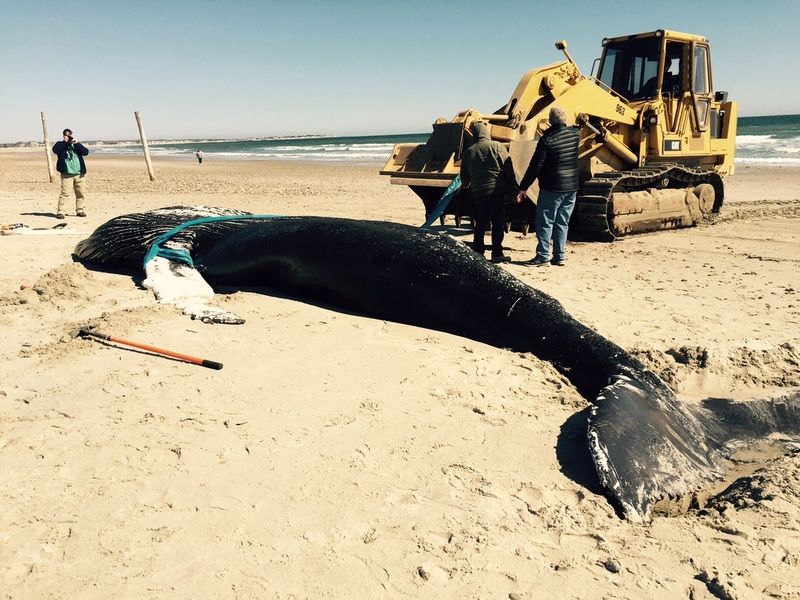 The fresh carcass of a thin, twenty-seven foot long, humpback whale yearling washed up on to Duxbury Beach about 35 miles south of Boston late Monday afternoon. 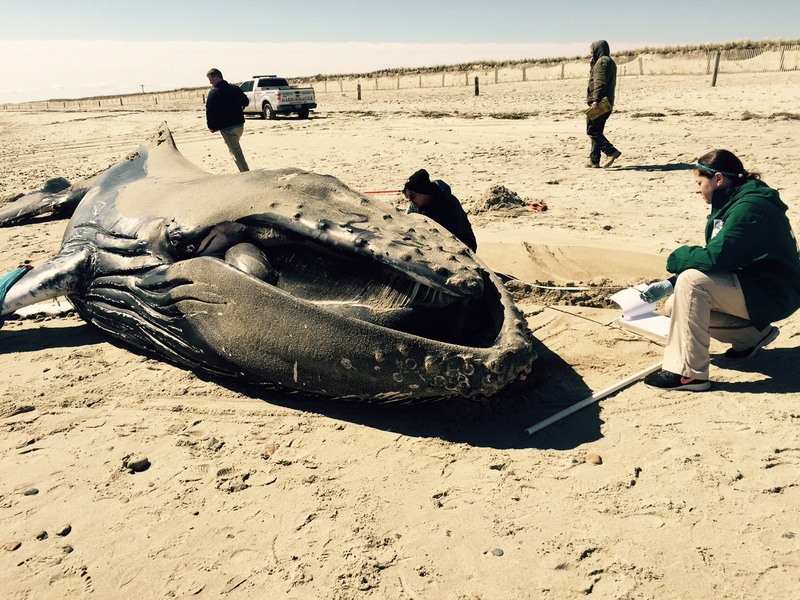 On Tuesday morning, the young whale was moved by heavy equipment to higher ground on the peninsula. Then a New England Aquarium team of veterinarians and biologists conducted an animal autopsy of the black-colored whale with its enormous white side fins. Heavy earth-moving equipment was used to move the carcass to higher ground. This female whale was noticeably thin. The body did not have marine gear on it or significant entanglement scars. The Aquarium staff and volunteers methodically dissected the whale, removing tons of blubber and tissue to look for clues that might indicate what contributed to its death. The whale’s stomach and GI tract were largely empty of food. The necropsy team examined the head area closely to look for evidence of some kind of injury that might have impeded the whale from feeding properly. They also took dozens of tissue samples for further testing to see if there was underlying disease or health conditions that contributed to the animal’s demise. clues as to what caused its death. This juvenile animal was most likely 14–16 months old, but also could have been a two year old if its growth had been compromised by chronic illness, injury, or poor nutrition. It was probably born from December of 2014 to February of 2015 off the northeastern coast of the Dominican Republic, the preferred calving waters for humpback mothers from New England. As a newborn, it would have been 14–15 feet long and weighed two tons! Mother and calf would have spent the winter nursing in the blue waters of the Caribbean. Early last spring, they would have swum up the East Coast, and the mother would have started voraciously feeding on small schooling fish, primarily in Massachusetts waters. Last summer, there was a bumper crop of their favorite food, sand lance, at the Stellwagen Bank National Marine Sanctuary, about 25 miles east of Boston and just north of the tip of Cape Cod. Like most mammals, the mother would have started slowly weaning this yearling in the late summer and early autumn. Eventually, by late autumn or early winter, they would have drifted apart, and this yearling would have been on its own. For most wild animals, the first year of independent life is a highly vulnerable one with increased mortality. If this yearling had survived to adulthood, it could have reached 40 to 50 feet in length and weighed 40 tons. The actual name or ID number of this juvenile whale might be able to be discerned. Pictures of its tail fluke will be sent to the Center for Coastal Studies, which will attempt to match its unique markings to a known animal in its humpback catalog. The Aquarium would like to thank the Duxbury Beach Association for its great and efficient logistical support and to the International Fund for Animal Welfare (IFAW) and Woods Hole Oceanographic Institution (WHOI) for sending experienced staff from Cape Cod to assist. Humpback whales are the stars of local whale watches, noted for being the acrobats of the whale world for their athletic leaps from the water. Population estimates for the region are around 800. NOAA, the federal oceans agency, recently proposed to remove humpbacks from the Endangered Species List as they have been a conservation success story. That proposal is still under review, but all whales would still remain protected in U.S. waters under the Marine Mammal Protection Act. Seals Belong on the Beach!